(Nanowerk News) Chemists and biologists from the University of Bath have developed a new technique that could be used to diagnose and develop treatments for age-related conditions like Alzheimer’s disease, diabetes and cancer. 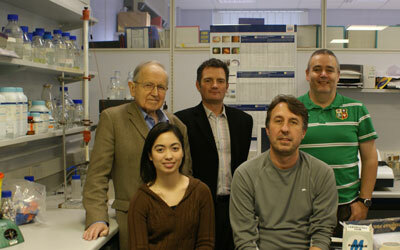 The project was a cross-departmental collaboration between biologists and chemists at the University of Bath, led by Dr Jean van den Elsen (front right) and Dr Tony James (back right). Dr Tony James from the University’s Department of Chemistry explained: "Not all sugars are ‘bad’ - in fact many proteins contain beneficial ‘good’ sugar units. PhD student Marta Pereira Morais added: “We believe our method will also aid the development of new drug based therapies for these diseases." The project was funded from a number of sources including the University’s Enterprise Development Fund (EDF), the Biotechnology & Biologcial Sciences Research Council and the Royal Society.